Michael Bradley is the pride of New Orleans. He is Mr. Year Round Tan. He is the Crescent City Saint. He is Malcolm West. He's also a good dude and a friend. I met Michael through Resistance Pro (a recurring theme in my life of late), but I probably saw him at comic cons before our RPro connection. He is a comic con fan and a wrestling fan. 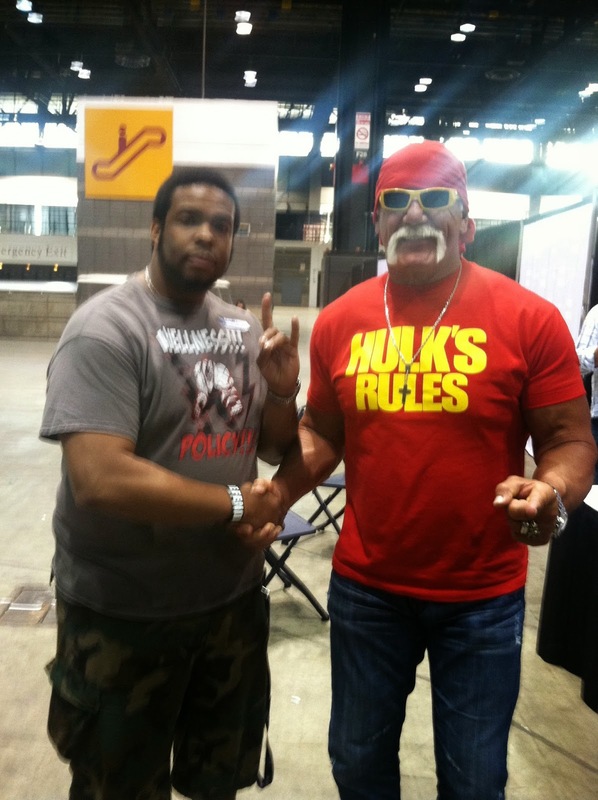 At C2E2 those paths crossed when he met Hulk Hogan . Like him or not, Hulk is one of the most famous wrestlers of all time. It doesn't get much bigger than the Hulkster. I know the feeling Michael had, because Matt and I also met Hulk at C2E2. Meeting wrestling royalty (or any genre's top people) is always unreal. You don't have to be a huge fan to appreciate the significance, although being a fan puts it into a whole other level. I know Michael will always appreciate that moment. Stuff like this never gets old. Michael Bradley and Hulk Hogan in Chicago, IL-April 2014.